1. 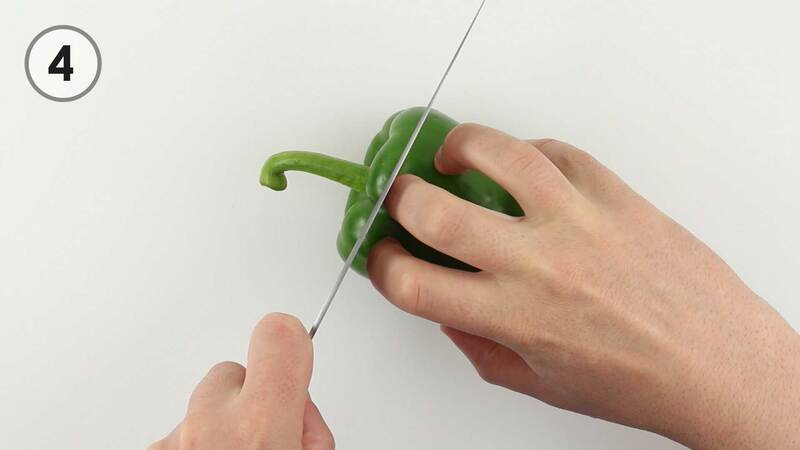 Hold your thumb on this side of the chef’s knife. 2. 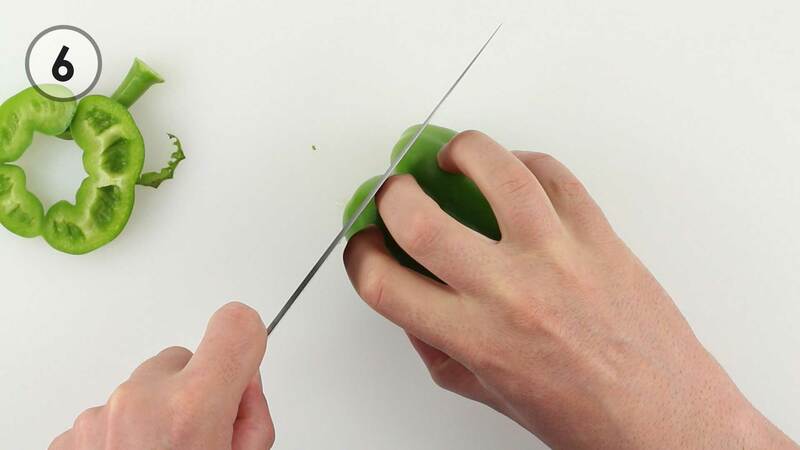 Wrap your finger around the other side of the chef’s knife. 3. 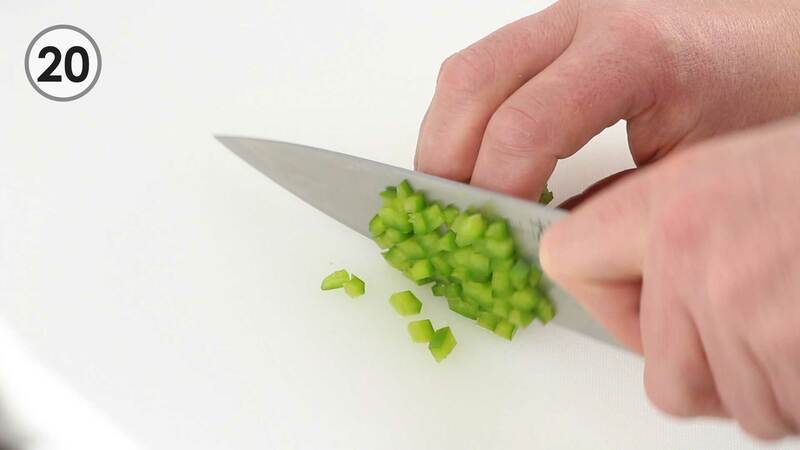 Curl your fingers back like a claw to keep them safe from the knife’s sharp blade. 4. 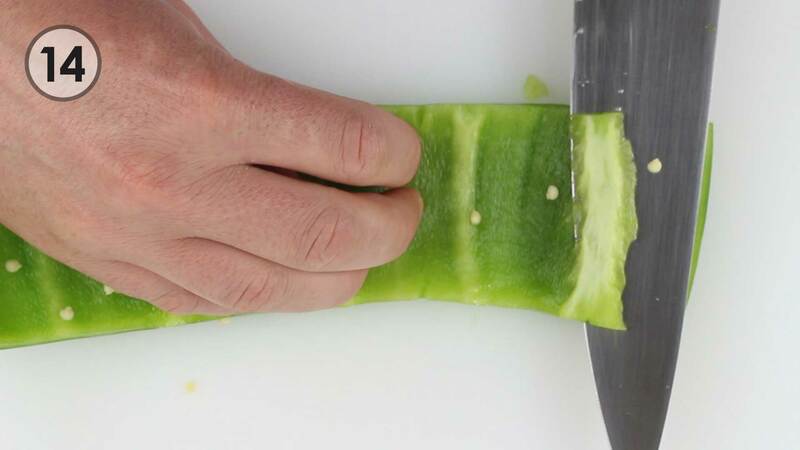 Use your knuckle as a guide for the chef’s knife. 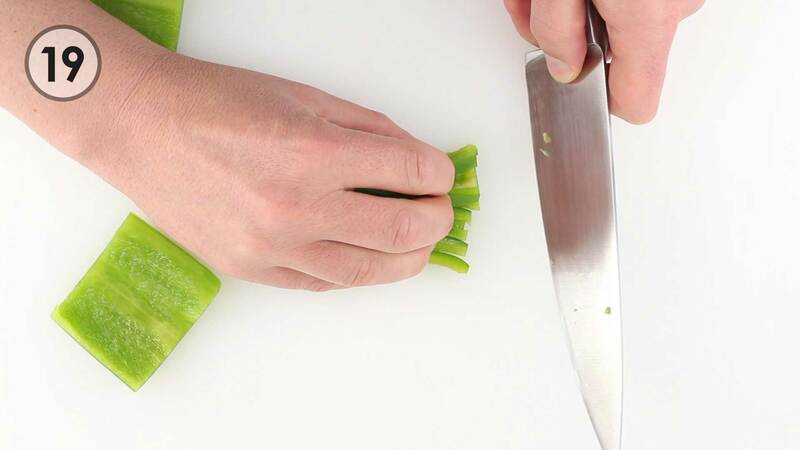 It should slightly contact the knife. 5. 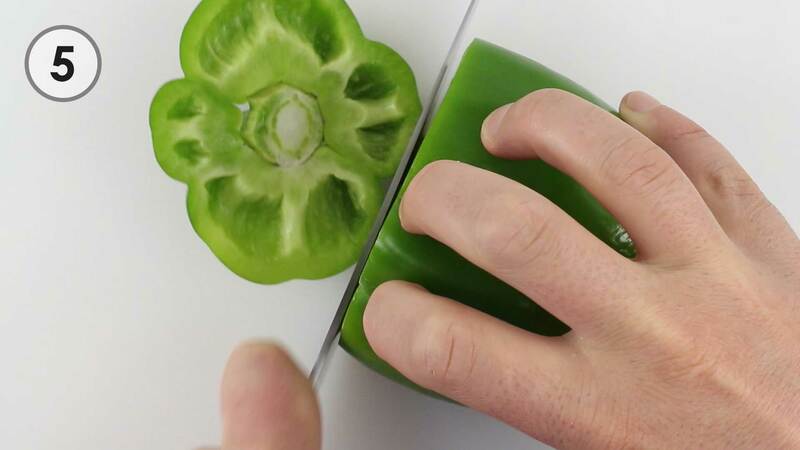 Slice through the bell pepper’s top. 6. 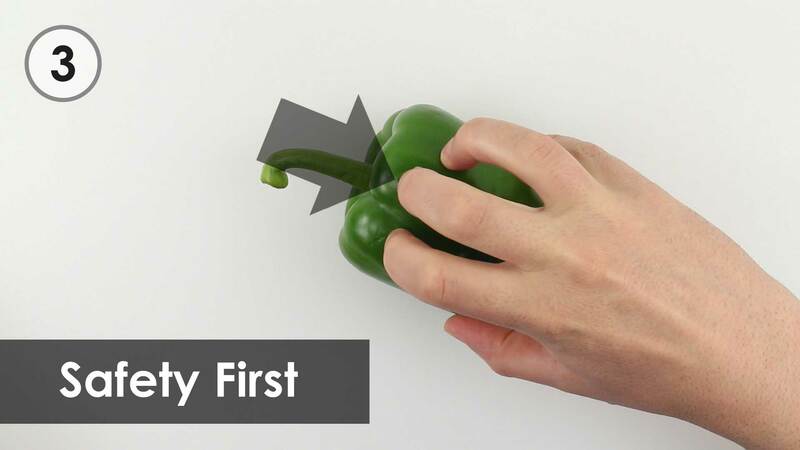 For the bottom of the pepper, use your knuckle as a guide for the chef’s knife again. 7. 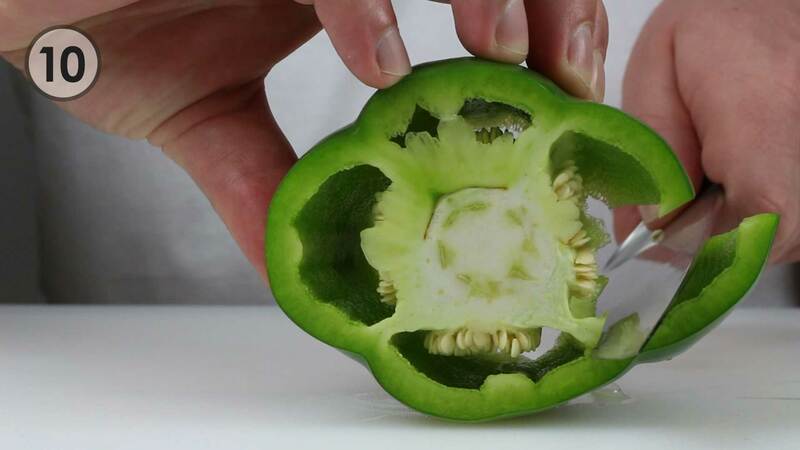 Cut through the bottom of the bell pepper. 8. 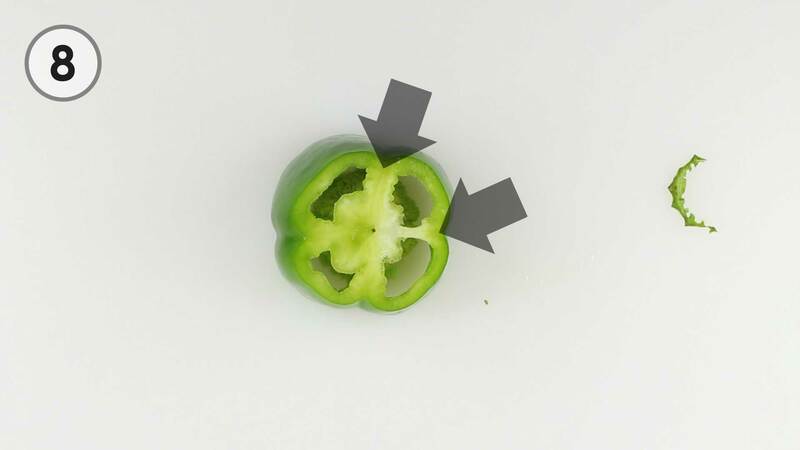 This is where the inner ribs meet the outside of the bell pepper. 9. Cut straight down in between any two of the ribs. 10. 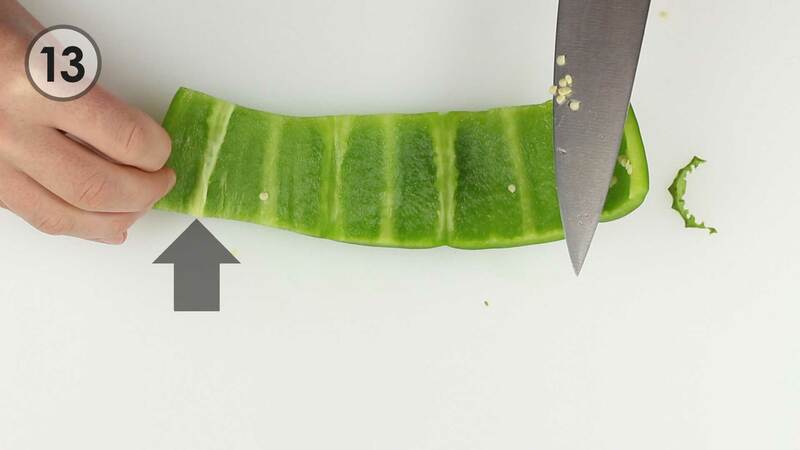 Roll the pepper while cutting in between the ribs and pepper’s outside. 11. 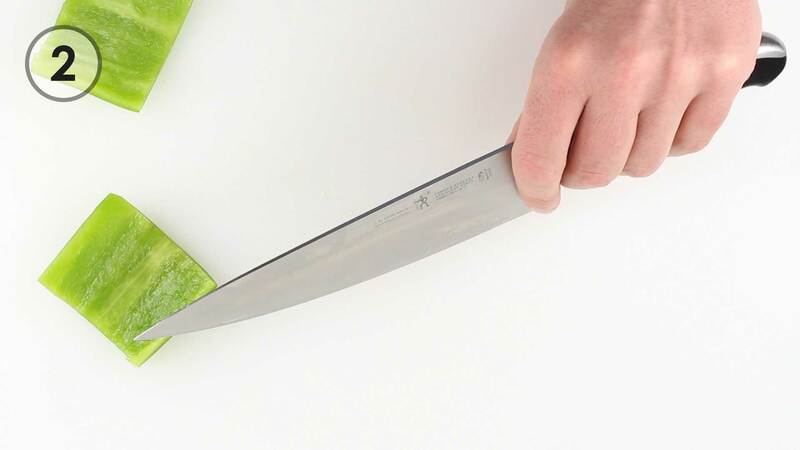 Keep your hand high on the inner structure away from the chef’s knife blade. 12. This is the inner rib structure you just removed. 13. Lay the pepper flat. Notice the white pith that was left behind. 14. 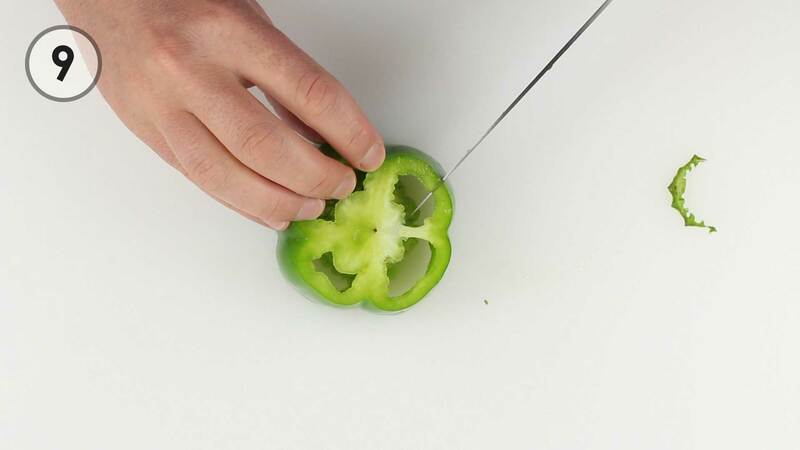 Using a sawing motion, shave the white pith off the bell pepper. 15. 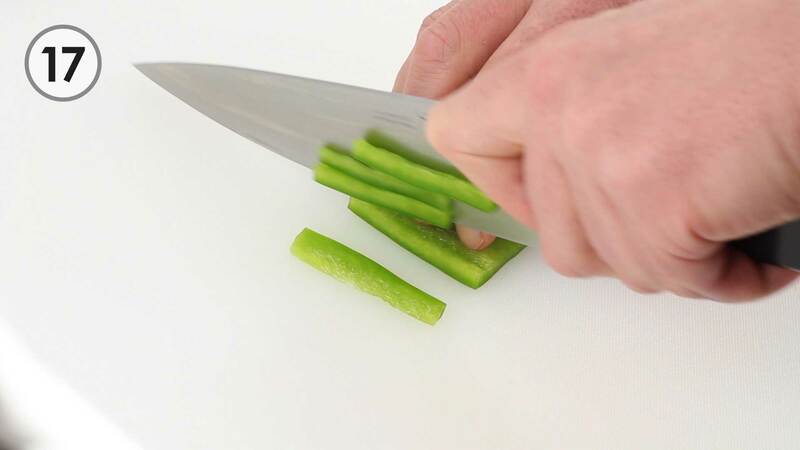 Cut smaller sheets out of the long sheet of pepper. 16. 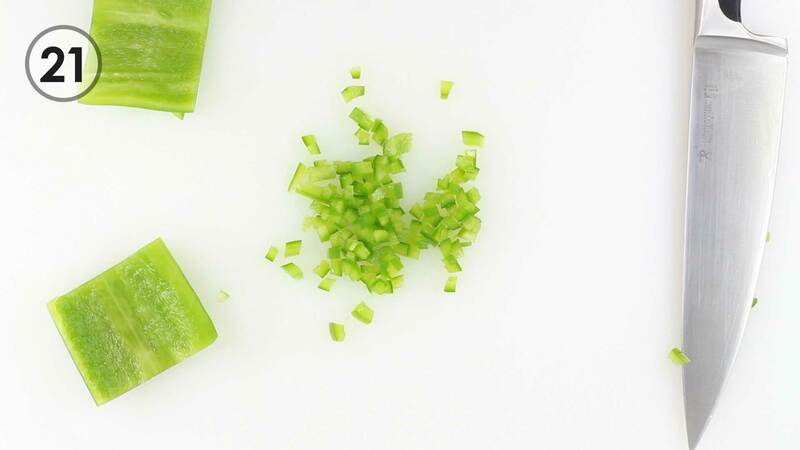 Slice julienne out of the smaller sheets. 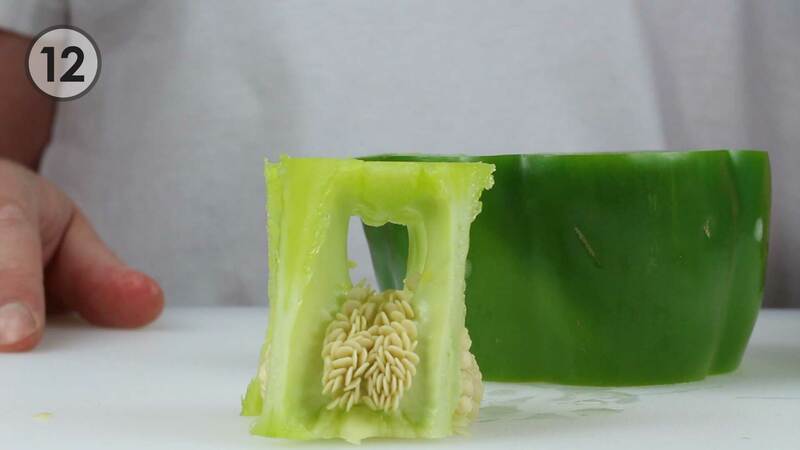 Julienne are about 1/8 inch or 3mm wide. 17. Cut in circular motions. 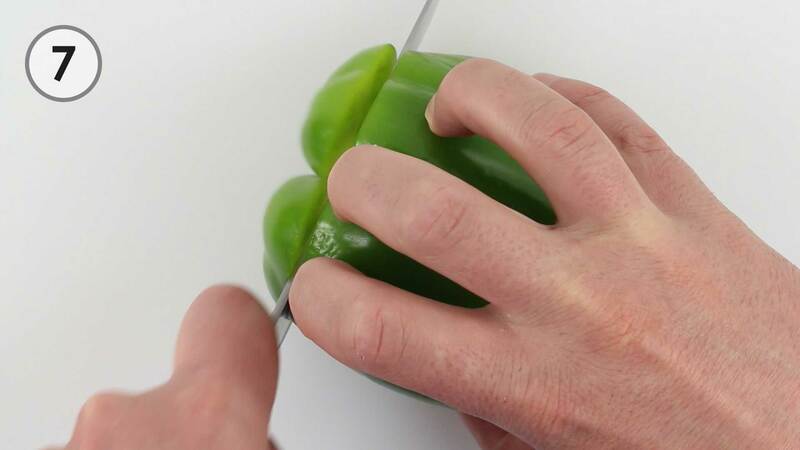 Keep a safe grip on your chef’s knife. Keep your guide fingers curled back for safety. 18. 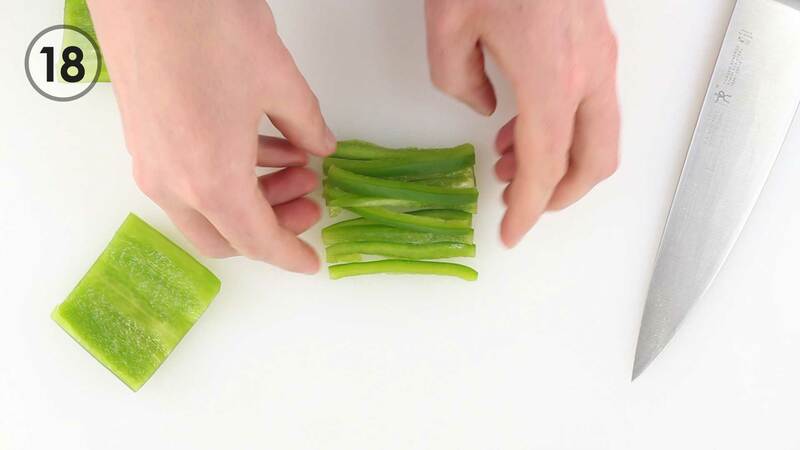 Neatly line up your julienne. 19. 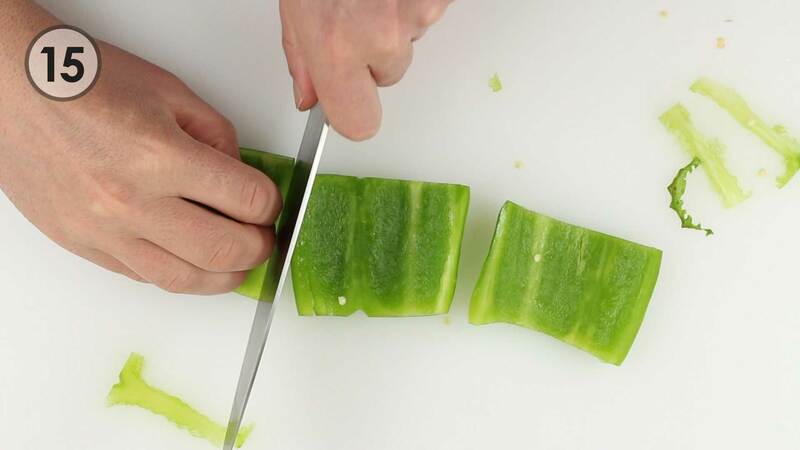 Before cutting small cubes called brunoise, get a safe grip on your chef’s knife. Curl your fingers back on your guide hand. 20. 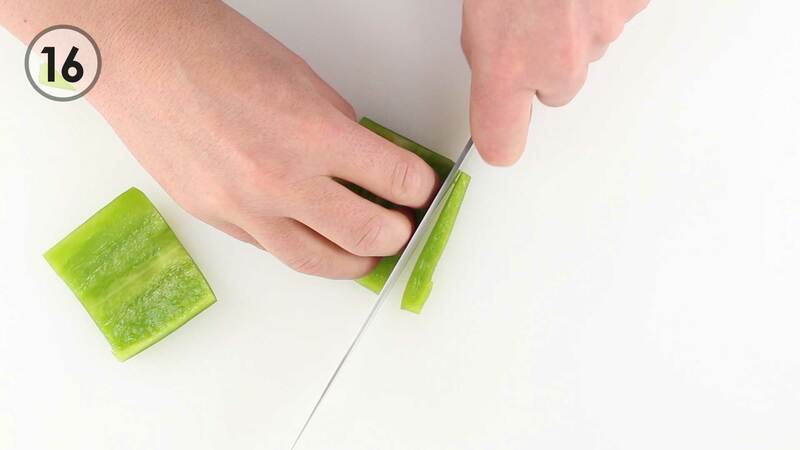 Cut in a circular motion, cutting the julienne into brunoise. Brunoise are about 1/8 inches or 3mm on all sides. 21. 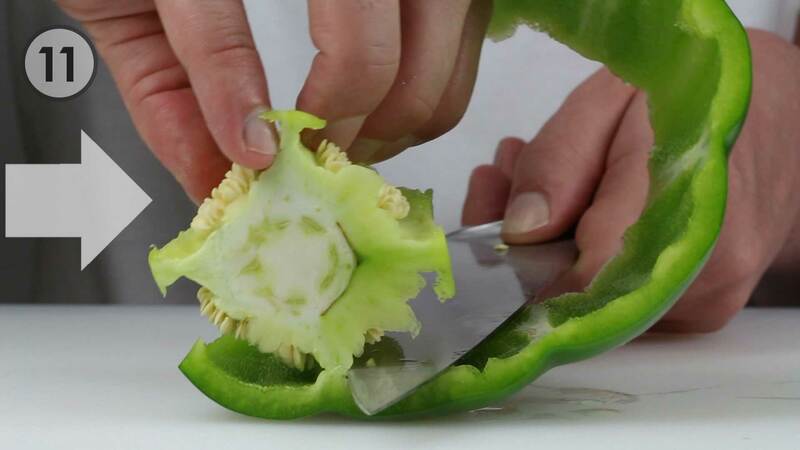 You have just learned how to cut a bell pepper. We couldn’t be more proud of you! How Much Salt do I use for Sauerkraut? Subscribe to the Secrets of Cooking blog Now!